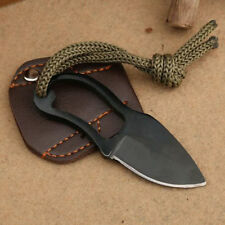 1 x Pocket Survival Tool. 6 4 position wrench. 10 2 position wrench. 7 butterfly screw wrench. 2 knife edge. 8 saw blade. 1 x Faux Leather Pouch. 11 kay chain hole. This multi-function folding gear works effectively with a variety of materials: food, textiles, sticks, etc. Premium stainless steel gear is sharp and corrosion resistant, suitable for outdoor use. 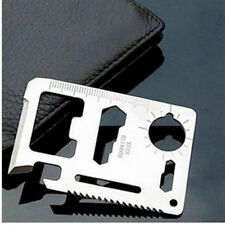 1 x Portable Outdoor Pocket Gear Folding Camping Tool Stainless Steel Survival Tool Hunting Gear. 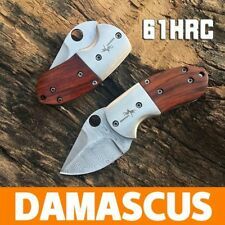 Blade material: Damascus steel (58-61HRC), light matte finished;. Handle material: Classic rosewood handle with steel bolster. 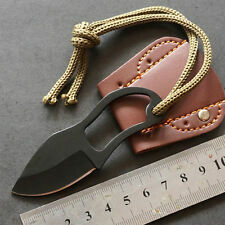 1Pcs Mini Pocket Folding Knife. 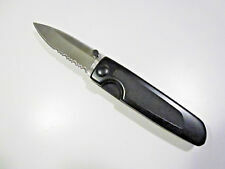 A cute little tool knife with drop point blade; Insert liner lock. 1 x Folding knife. - Blade Length: 57mm. - Blade Thickness: 2.8 mm. - Blade Width:23cm. - Material: Stainless steel 3Cr13,Steel&wood handle. Material: D2 steel &wood handle. 1 x Folding knife. - Blade Length: 62mm. - Blade Thickness: 3.2 mm. - Blade Width:22cm. 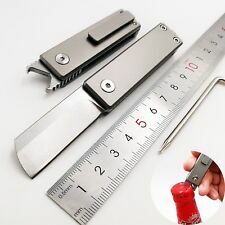 Serger Mini Folding Knife M390 Blade TC4 Titanium Handle Pocket Knives. Blade length: 4.2CM. Blade Process:Stone Wash. Handle length: 6.6CM. We are not responsible for any wrong or. 1 x Folding knife. - Blade Length: 57mm. - Blade Thickness: 2.9 mm. - Blade Width:25cm. - Material: Stainless steel 3Cr13,Steel&wood handle. 1 x Folding knife. - Blade Length: 7.5 cm. - Blade Thickness: 3 mm. - Blade Width:2.8cm. - Material: Stainless steel 3Cr13,Steel&wood handle. Material : Stainless steel,Blade material: 440C,Hardness: 57HRC. Blade length: approx. Blade thickness: approx. Handle length: approx. Rate (item arrived). Spindle system: KVT ball bearing (ceramic beads). Handle material: G10, steel lining. Blade: D2 steel. Blade length: 12 cm / 4.52". Blade thickness: 4 mm. Knife Type: Folding. It is small but more special stainless steel handle for choice. Good for outdoors, camping and leisure, more safe and convenient to carry. Blade material: Stainless steel. Blade length: 68mm. Blade Length: 87cm. Blade Width:20cm. Blade Thickness:2.2mm. Open Length: 210 cm. Assisted Opening Allows Safe & Speedy Blade Deployment! Handle: tc4 titanium. Blade materail: D2. Lock type: liner lock built-in quick-opening bearing, the whole knife is pulled out by the CNC computer, and the hand feel is very good. Blade length:7.2. Blade width: 2cm. 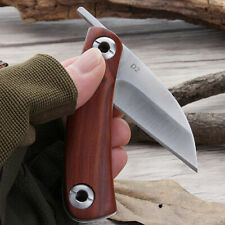 Folding Knife D2 Blade Rosewood Handle Pocket Knives. Blade length: 4.1CM. Blade Process: Sanding. Handle length: 7CM. Knife Type: Folding. It is small but more special stainless steel handle for choice. Good for outdoors, camping and leisure, more safe and convenient to carry. Hardness: 55HRC. Blade material: Stainless steel. Features: Open is a dagger, folded is a hand spinner, the two body in one, is a good multi-functional outdoor products. 1 x Multifunctional Spinner Folding Knife. The knife should be placed in a safe place to keep away from children. Blade thickness: 0.18cm. Handle material: Brass shells, colors are different, in order to prevail in kind. Other: sharp edge, steel and wood handle different colors and patterns, in order to prevail in kind. Type: Linerlock; Closed: 3.5; blade: 2.5". Stainless. Little Torpedo Folding Pocket Knife with liner lock and clip attach. NOS. Blad e Material ：7CR17MOV. Blade Width：2.2CM. Handle Material：Steel. HandleLength ：9CM. BladeLength ：5.5CM. Type: Linerlock; Closed: 3.5"; Blade: 2.5", Stainless, Partially Serrated Edge; Handle: Black, Rubber; Other Info: Lanyard Hole, Pocket Clip, Thumb Slot. Knives feature synthetic handle onlay with wildlife artwork. Swedish Powder Damascus Steel Blade Folding Knife Natural Old Tree Ebony Brass Handle. Blade Material: 100% Swedish Powder Damascus Steel. Blade Process: Damascus Original Pattern. Blade length: 4.2CM. Wonderful Taiwan Quality Pocket Knife FC3503A. High Quality Made in the best knife factory in Taiwan. This knife was not intended for export to the US. Our supplier was in Taichung, Tiawan and brought back a case. Hardness: 55HRC. Knife Type: Folding. It is small but more special stainless steel handle for choice. Good for outdoors, camping and leisure, more safe and convenient to carry. Blade material: Stainless steel.